Myers says that you should develop a follow-up strategy ahead of time. 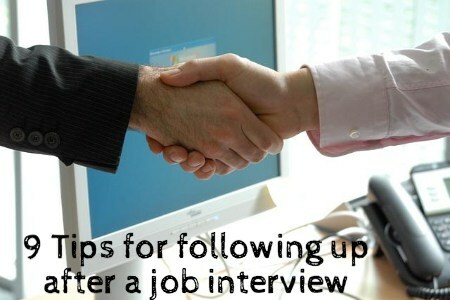 Know that you have a follow-up strategy will influence the way you behave during a job interview. Part of the reason is that this knowledge results in self-confidence, and those with confidence are more likely to be hired. “Act more like a consultant than an applicant,” suggests Myers. “Focus on asking intelligent, probing questions about the employer’s business needs, problems and concerns.” Writing down the answers to your questions, he continues, can provide you with insight as you follow-up further. Rather than push for an offer quickly, angle for another meeting. Myers says that, in many companies, the initial interview isn’t about deciding who gets the job. It’s about deciding who gets to have an interview with someone higher-up. Don’t rush this. At the end of the job interview, make it a point to confirm what’s next, rather than letting the interviewer tell you that they’ll let you know. “Assume a more assertive position, and get a commitment from the employer for what comes next,” says Myers. Make sure you send a thank you note to an interviewer. Sending the note within two or three days is appropriate. If you have offered to send documentation or other information, be sure to send that quickly as well. You want to impress upon your interviewer your value as someone who responds as promised. “Use every follow-up contact as a chance to build your value,” says Myers. Whether it’s quickly providing promised information or reminding your interviewer of the way you handled a situation, make sure you build value when you can after the job interview is over. Myers points out that business etiquette includes punctuality. On top of that, you want to make sure that you are also persistent. Be sure that you express sincere interest in the position, without crossing the line and becoming a pest. Don’t splash information about your interview and the company all over social media. “If you have contacts and connections with anyone who might influence the hiring decision, or who actually knows the interviewer, ask them to put in a good word for you,” says Myers. Many of us are loath to use these types of connections, but it’s the smart play — especially since who you know really does matter. No matter what you do or who you know, you might still be passed over for the job. Make sure you are gracious if that happens. Don’t be angry, and don’t lash out in a public forum, such as on social media. You might still be offered a position down the road, whether you are considered after the first candidate turns it down or whether you asked to fulfill a different role. You can even still send a polite thank you letter afterward to express your gratitude — and hope that you can work at the company in the future. Your job interview is just the beginning. Be sure to follow-up effectively to improve your chances of future employment. ← How Do You Observe Memorial Day?